Bekah Enns’ great-grandparents would not recognize the way she is pursuing an academic degree in 2013. For one thing, the senior history major at Eastern Mennonite University spent last semester off campus, testing her work skills in her three academic minors—pre-law, political science, and peacebuilding and development. Her experience reflects the new ways and new places that education takes place these days for EMU students, including off-campus internships, cross-cultural experiences, grant-funded research and practicums, and being part of a cohort at a site to which EMU faculty come for classes. Enns, from Winnipeg, Canada, lived in the nation’s capital at EMU’s Washington Community Scholars’ Center. While taking two courses at the center, she worked at Shoulder to Shoulder, an interfaith coalition that seeks to end anti-Muslim sentiment in the U.S. As an intern with the organization, she used her experience as co-editor of The Weather Vane, EMU’s student newspaper, to produce a bi-weekly newsletter, compile fact sheets, and otherwise pitch in on the group’s various initiatives. An internship through EMU’s Washington center is more than just a taste of real-world work and an opportunity to develop contacts, ideas, and credentials for life after college. It’s also a launching point for deeper examination of the relationship between faith, values, and career. “How do we as Mennonites engage the state, and how much do we build our alternative systems?” asked Enns, whose great-grandparents were part of the mass migration of Mennonites from Russia to North America during the turbulent years after the Bolshevik Revolution. What relationship, exactly, should a person of faith hold toward advocacy in a secular environment, she wonders. Doesn’t faith like hers, one that prescribes action on behalf of “the least among us,” require this sort of entanglement with the wider world? But does this very entanglement with the wider world undermine the foundations of her faith? Enns doesn’t have answers to her questions yet, but she knows she would like to continue doing faith-based advocacy after she graduates this spring. In fact, her plans at this point are to join Mennonite Voluntary Service. During her four-year career at EMU, Enns took advantage of other non-traditional ways of learning. Soon after she arrived on campus as a first-year student, she took an optional field trip with her Restorative Justice and Trauma class to a penitentiary, where she participated in three days of a Quaker-developed “Alternatives to Violence Program” with inmates. In her sophomore year, Enns satisfied EMU’s cross-cultural requirement by creating her own semester-long study experience in the African nation of Chad, where her parents were serving with Mennonite Central Committee. For 10 weeks between her junior and senior years, Enns was part of a Ministry Inquiry Program offered at EMU that gives college students a chance to be an intern, mentored by a pastor, in a congregational setting. Her assignment was at Fourth Street Community Fellowship in Washington D.C.
EMU offers a variety of other new ways and places for students to pursue their education. More and more graduate students are taking their courses online, usually studying from their homes. The Seminary was the first unit at EMU to offer distance learning, and now most of EMU’s six other graduate programs also offer courses online. Nurses who are studying for a master’s degree in nursing leadership and management don’t have to come to campus very often (or to EMU’s campus in Lancaster, Pa.). The program is designed for working nurses who need to maintain family commitments and remain on the job. Jeanette Nisly ’96, for example, is earning her nursing master’s while teaching healthcare workers in Guatemala and raising two children with her Guatemalan husband. Sometimes the students are surprised to see that online learning actually offers more interaction with class members and professors than a traditional classroom. A faculty advisor provides ongoing support for students and helps with logistics, technology questions, and other issues. Students also receive support from EMU’s information systems staff, graduate writing tutors, and library staff. The Women’s Peace Leadership Program, which offers a mix of study through the annual Summer Peacebuilding Institute at EMU and experiences in the students’ home countries. The first group, in 2012, included 12 women from Africa and the South Pacific. They were selected from more than 100 applications. Funds for the program are provided by USAID and the German development organization, EED/Bread for the World. Research grants and practicums that take EMU students off-campus. The latest example, announced in February, is a $20,000 grant from the United Service Foundation that will send eight undergraduates to foreign locations (Colombia and Iran in 2013), supervised by an EMU-linked mentor. The grants are for peacebuilding and development majors, who are required to complete off-campus practicums. Attending EMU classes in Philadelphia and other sites. Many of the students enrolled in EMU’s programs run from Lancaster, Pa., don’t actually go to classes at the center’s facility in a business park. 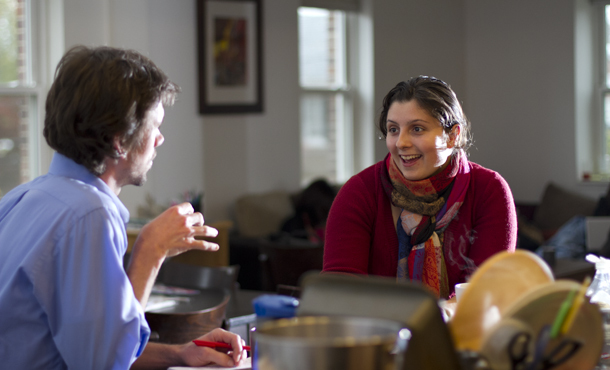 Students in the pastoral studies program, for example, attend classes this spring at Lancaster Mennonite Conference offices or sites in Philadelphia, Hatfield, and Morgantown. The three-year program, called STEP (Study and Training for Effective Pastoral Ministry), is for new pastors or prospective pastors. Taking trauma courses all over the world. In the wake of the 9/11 terrorist attacks, EMU’s Center for Justice and Peacebuilding established a program to help community leaders deal with the trauma of disasters and conflict. Called STAR, which stands for Strategies for Trauma Awareness and Resilience, the program has trained more than 7,000 people worldwide. The training seminars take place at EMU, across the United States, and all over the world in places like Lebanon, Haiti, and Mexico.